Membership has grown steadily to its present total of just over one hundred. Originally called Pitsea Joggers, we used to meet on a Friday evening in the car park in Gloucester Park, then as membership increased the running improved, our name progressed to Pitsea Road Runners in September 1984 and our Friday night venue moved to Basildon Rugby Club. The club consists of beginners to seasoned athletes and prides itself on its friendly atmosphere which it keenly maintains. We also encourage a strong social side with various functions organised throughout the year. 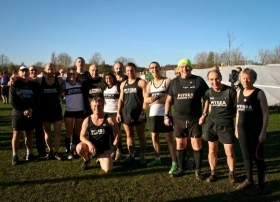 The club is involved in the following cross country leagues, the Essex League (Saturday afternoons), the South Essex Cross Country League (Sunday mornings) and the Mid Essex League. The season starts in October and ends in March. These leagues are for both men and women.